~ Excerpted from Beeton’s Book of Needlework, first published 1870. Messrs. Walter Evans and Co.’s knitting cotton No. 12; eight ply fleecy wool. 1st row: Alternately throw the cotton forward, knit 2 together. 2nd row: Slip 1, knit the other stitches. 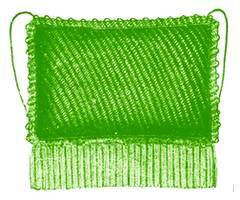 The stitch formed by throwing the cotton forward is knitted as 1 stitch. 3rd row: Knit 1, * throw the cotton forward, knit 2 together. Repeat from *; after the last decreasing knit 1. 4th row: Like the 2nd row. These four rows are repeated till the cover is sufficiently large. Draw a narrow piece of red worsted braid through every other open-work row of the pattern, as can be seen in illustration 341. When the cushion has been covered with the knitting, it is edged all round with a border knitted the long way, in the above-mentioned open-work pattern; it is 14 rows wide, and also trimmed with worsted braid; a fringe of grey cotton and red wool, 3 1/4 inches wide, is sewn on underneath the border at the bottom of the cushion; to this is added a thick red worsted cord, by which the cushion is hung on over the back of an arm-chair. The cushion, on account of its simplicity, is especially suitable for garden chairs.